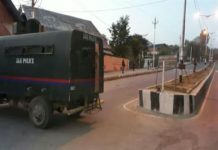 Home The NewsMill Residents of J&K its rightful owners: Farooq.. 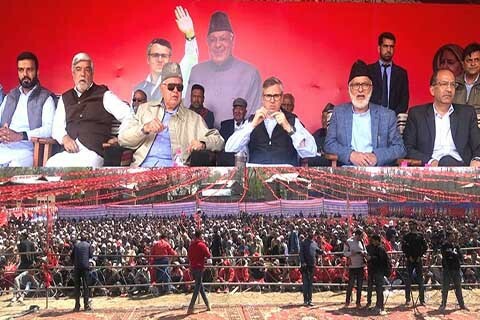 Residents of J&K its rightful owners: Farooq..
National Conference president Farooq Abdullah Wednesday said that the people of Jammu and Kashmir are the “rightful owners” of their land and nobody would dare fiddle with the integrity and identity of Kashmir “till the party’s flag exists”. 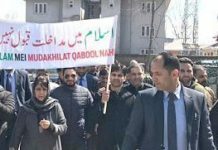 Farooq, according to a National Conference statement, said at a public meeting at Beerwah, Budgam, that the NC flag symbolised sacrifices of thousands of people for the better future of Jammu and Kashmir and its people.“The state is fraught with tumultuous times. Our special constitutional position has become a sore in the eyes of those who are hell bent on destroying the very fundamentals of our accession with the Union of India. Time has come to make it clear to such forces as are inimical to our identity how passionately we feel about our unique identity,” he said. Farooq, while lashing out at BJP-RSS for “tarnishing the secular face of India”, said: “Today we are facing such forces in our country that have always shown abhorrence for the inclusiveness of Indian democratic set up. The forces are pitching one community against another without realising its far-reaching consequences. The constitution of India ensures all its citizenry equal and undaunted basic rights”. Referring to “the sorry tale of minorities in India under BJP”, Farooq said that “today our nation is facing immense hazard in the form of communal strife. We are at crossroads, now it is up to us to decide if India remains secular and progressive in its outlook wherein all the communities thrive and draw their sustenance affably or a country which is tangled with the clutches of communal strife and bigotry”. “Now it is up to the people. The opportunity has come. We should not let it pass by us unutilized,” he said.He flayed the Peoples Democratic Party for surrendering state’s fiscal autonomy, the statement said. “In 1996 when I took over as the chief minister, sales tax amount was overdue to people. But the situation was such that the people were not in a condition to pay back their dues. Sensing the appalling financial condition of the people, I waived off some amount and doled out well thought-out policy wherein people were told to pay back the sales tax in twenty years’ time. But now we cannot imagine easing the burden off people’s shoulders, all thanks to PDP government which took no time to implement GST in our state. Now if the state government wants to do something on those lines, it has to get permission from the Centre”. “This is what PDP has done. 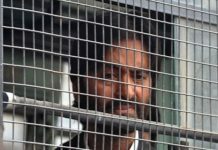 Whatever was left of our autonomy, they shamelessly surrendered it before the Centre for the sake of chair and power,” the statement said.“So enamoured were Muftis by the lust of power that they gulped down the insult inflicted by PM Modi on late Mufti Sayeed publicly while addressing a public meet in Srinagar. Had I been there I would have bade good-bye to the coalition and Modi on the spot. But that requires moral strength, which time has shown is lacking in PDP,” the statement read. Previous articleGovt bans civilian traffic on highway for 2 days a week. Next articleGhosn: Former Nissan chief arrested in Japan on new claims.